- Compact Lifts 440-1650 lb. Forks lower to 3 1/4 in. Lifts lower to 3.25", giving you good clearance beneath the skids. 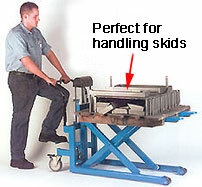 This allows you to easily glide the lift beneath a loaded skid and lift it without much fuss or hassle. Twin heavy duty lifting chains provide a 2:1 lifting rotation that reduces stress on cylinder seals, resulting in a longer service life, more reliable lifts, and less maintenance. Models LV-100 and LV-100W feature an offset steering & lift handle (photo shows optional table top). This makes it easier to lift and steer the skid lift, even loaded down. Locking brakes are standard on these lifts, allowing you to lock a lift in place once you have it where you want it. Twin hand controls select neutral position for lowering for the LV-100 lift.